Apple is the most valuable company in the world today. The main reason for Apple’s success (apart from great products) is how it fights in the mobile war. Apple uses the Guerrilla warfare strategy to make all its competitors bite the proverbial dust. Guerrilla battle teams rise from the ashes of past defeat with the wisdom required to win. Apple was a fading company in the 90s. With the learning from previous failures, Steve Jobs’ leadership, and the launch of the iPod Classic, Apple rose from the ashes. The rest, as they say, is history. Guerrilla battle teams are hidden until they attack the enemy. Similarly, Apple, with its absolute secrecy, ensures that its product strategy is always hidden. Its product lines, features, and components are always shrouded in absolute secrecy before launch. For example, nobody knew Siri was the key feature before iPhone 4S was launched. Guerrilla battle teams use their weakness as strength. For example, they are small (weakness) and hence extremely mobile (strength). Unlike Windows, that can run on a variety of hardware Mac OS X could only run on the Mac hardware. This exclusivity was perceived as Apple’s biggest weakness. Today, because the iOS runs on iPhones, iPods, and iPads, it thus creates a common framework for Apple Apps. Across various Apple devices, Apple users have downloaded the apps over 25 billion times. This uniformity of hardware and operating system is now Apple’s biggest strength. Guerrilla battle teams enjoy public support – that’s why they win. Similarly, Apple has built a huge cult following over the years that it can tap into. Mac, iPhone and iPod users always remain loyal to Apple. This fan base is a huge plus for Apple since loyal users always upgrade to the newer versions of Apple products. For instance, have you ever heard of people standing in lines overnight for Android or BlackBerry devices? Guerrilla battle teams draw their strength from the weakening enemy. This tendency is psychological as well as practical. As RIM constantly reduces the price of the BlackBerry Playbook, it shows that the BlackBerry Playbook is not worth the original price. HP shutting down its tablet business signifies defeat. The weakening and dying enemies help Apple grow stronger psychologically as well as in market share. When Sun Tzu wrote the Art of War, I’m sure he did not think Apple would use it to reach the zenith of excellence and success! Laptop, Netbook, Tablet or Smartphone? The problem: I already have a desktop at home as my primary computer. I am trying to choose my secondary device to carry around with me. I am looking for something that I can travel with and also take with me to the local coffee shop. I am interested in social networking, writing blogs, Google Maps, and e-mails, but nothing much else. Laptop: Carrying a laptop has its own advantages and disadvantages. A laptop is a complete system with a lot of processing power. A good laptop has enough battery to last you a long time. With a large screen, and multiple programs installed, a laptop is a good workhorse to carry around on a day to day basis. On the downside, it is heavy, bulky, and comes with a lot of accessories that need to be carried around. The power cord, the laptop case, and the mouse (an optical mouse or a magic mouse for a Mac). Netbook (Ultrabook): The best part of the netbook is its battery power. Most netbooks have a battery life of around 8 to 10 hours (the ASUS Eee PC 1000 HE). However, it has a small screen without a CD/DVD drive. A netbook is slower and mostly used for travel. A netbook is very compact, but can be used only for email or basic surfing. Once you start doing some advanced word processing or graphics, and the netbook starts stalling. Tablet: A Tablet is a very good option IF you don’t need to type a lot. Most tablets are very good for multimedia, movies, and social networking. If you need to type a lot, you need to have an external keyboard. A tablet does not have tactile feedback and you don’t feel it when you have pressed a key. Some tablets can play a sounds when a key is pressed. Also, in some tablets, the key is highlighted when you press it. Other than that, there is no tactile feedback. A good bluetooth keyboard is very important for a tablet in case you need to do a lot of typing. Smartphone: A Smartphone is a very good option if you want to make and receive calls (and stay connected to the Internet). You can use a smartphone for emails, social networking, and apps. The smartphone is always connected to the Internet. The best part of a smartphone is it does not need to be booted up like a netbook or a laptop. Since smartphones are basically phones, they are always ON. 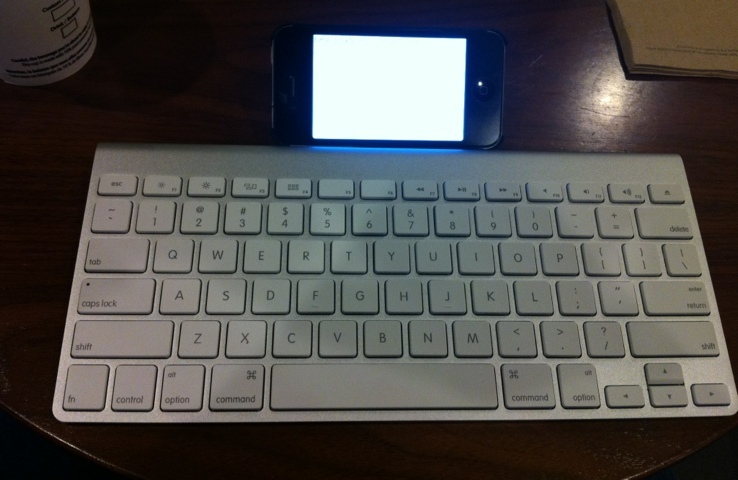 Using a bluetooth keyboard, you could always type a lot of long emails or blog posts. The screen is small, but with a slightly larger font, it would be readable from a distance, say top of a table. Assuming you don’t want to invest in a laptop or a netbook and you want something as your ‘secondary’ device, a tablet or a smartphone can serve as a very good option. How do you choose your secondary device? Here’s how you can decide. Which of the following features do you want to use the most? Once you zero down on what you want to do, we could probably choose the best device. Tablets are really cool since they can do all of the above (with an external keyboard of course!). Let us assume you just want to type long emails or blog. And you also like to interact with people using Facebook. If you don’t want to watch movies or do anything advanced on your device, maybe a smartphone with a keyboard would be a good idea. 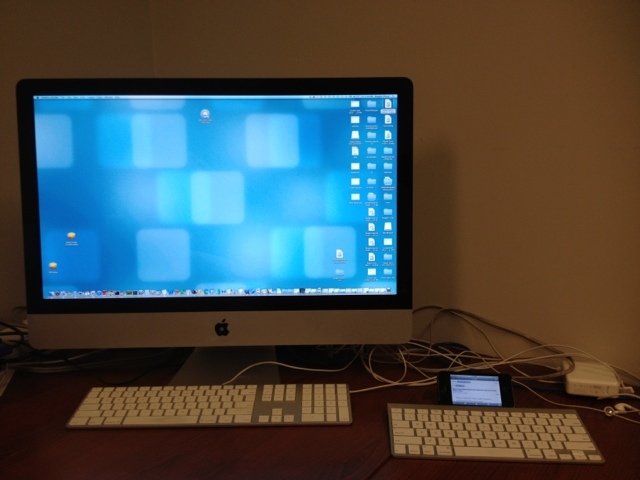 If you would just like to use the device for blog posts or long emails, it might be ok to have a small screen. You could just get a bluetooth keyboard and type away! However, if you want to do something rich in multimedia, watch movies or just edit photos, you might want to go for a tablet. But you can’t really carry around your iMac, can you? Another good device (which the ad classifies as both a tablet and a smartphone) is the Samsung Galaxy Note. The Samsung Galaxy Note is slightly bigger than smartphones but definitely smaller than a tablet. Once devices like the Samsung Galaxy Note enter the market, the decision just gets more difficult. In a world where you need to decide between netbooks, laptops, tablets, and smartphones what would you call the Samung Galaxy Note? The decision just became harder. The Internet is the new war zone and the new battlefield. Hackers, those neglected nerds, are the new special forces. Why is the Internet such an important zone for countries to assert their dominance? The only Media – The Internet is used to build as well as destroy regimes. Sometimes, the Internet is the only way for people to broadcast the oppression when traditional media is suppressed. Everything is connected – Millions of smartphones, satellite telecommunication, VOIP, and Internet data allow countries to tap into vast amounts of data easily. For every lock, there is a key – Given enough processing power, any encryption can be broken. Decrypting ; is difficult, but not impossible. Easy to Propagate disaster – Spyware, malware, virus, root kits, and ransomware can be injected via the Internet to disable critical computer systems. Destroy the Economy – Inject a virus into the stock market. Cripple banking transactions. And the economy comes to a standstill. Untraceable – With multiple computer systems across the world, messages that bounce from one system to another multiple times before reaching the destination can never be traced. Cyberwar can also make surgical strikes on specific computer systems and retrieve data quickly. Sometimes, the only option – Disabling the communication network of the enemy is easier and leads to zero collateral damage as opposed to attacking the enemy. Many steps are being taken by countries to protect themselves from the threat of Cyberwar. In 2009, President Obama declared America’s digital infrastructure as a Strategic National Asset. In May 2010, the Cyber Command Task Force was established in America. There is a lot of focus to secure critical systems – both for enterprises and governments. The next war won’t be a nuclear war. It will be a Cyberwar. Cloud computing, cloud storage, and virtualization technologies have taken the world by storm. However, as of today, we do not rely on cloud computing completely. But 18 years from now, things will be different. Very different. How will our computing experience change over the next 2 decades? Lightning fast Internet speeds – Today, we have a residential speed of up to 250 Mbps. In the late 90s, it used to be 256 Kbps. Analyzing the geometric progression of Internet speeds, we will most likely have residential speeds of 500 Gbps. Applications on the Cloud – Google Docs are already available over the cloud. Microsoft Office is also available over the Cloud. It would not be surprising to have all our programs installed on the Cloud instead of our hard drives. You don’t have to worry about software upgrades, bug fixes, or even licensing. Going forward, you could see operating systems on the Cloud. Do you need to use Windows Server 2030 today? Just logon to the Cloud. Data on the Cloud – This is again, not a very new concept. With multiple Cloud storage options available today, it can only mean that all hard drives in the future are virtual hard drives on the Cloud. All the data will be on the Cloud. Your computer may get stolen, or destroyed in a fire. But your data will remain safe and accessible from across the globe. Virtualized Hardware – Two decades from now, you could buy processing power over the Internet without having to upgrade your home computer. Wouldn’t that be cool? Also, you could rent more processing power in the short run for an upcoming project. After the project is done, you could scale back and reduce the processing power. Similarly, you could increase or decrease the memory at will. You don’t need to run to Best Buy to upgrade to the new, faster processing chip! Virtual Reality – With exponential processing power, faster hardware, super-speed Internet, and infinite cloud storage, there will be virtual reality instead of just browsing the Internet. You could first go and walk around in your local Sears store ‘virtually’ before going there ‘physically’. You could see and feel the items before even setting foot in the store. Cloud will be the new hangout – Do you want to meet at my Cloud or at your Cloud? Do you want to have a quick online virtual meeting at my cloud? Lets do some research at my cloud and then transfer the data back to your Cloud. Iris Scan will be your encryption – Wear your headset, scan your iris, and enter the Internet. With multitude of hacking and cyber warfare incidents, encryption via secure authentication will be required to get on to the Internet and access your Cloud. You will then be able to access everything, go anywhere, do anything – virtually. The biggest datacenter will control everything – The biggest datacenter providing the cheapest and fastest cloud storage will control the Internet. Datacenters will be built in the Arctic so the cold air could be used to cool the CPUs. Two decades from now, we will not be limited by processing power, memory, or even storage. Scalability, sustainability, security, and reliability of technology will ensure that the Cloud is widely used and adopted across the world. The Internet will finally be called The Cloud. I need a netbook for traveling. A compact netbook, with a battery life of 8 hours or more suited my requirements perfectly. I could use it for surfing the Internet on WIFI when I am out and about. I also need a desktop that is permanently attached to my printer. Whenever I need to print something, I don’t want to boot up my laptop, take it to the printer, plug it in, and print a few pages. I want a permanent kiosk-type setup where I could quickly surf the Internet when required and never have to wait for my laptop to boot up. The dilemma was: which one should I get first? If I got the netbook, I would still have to go back and forth between the printer in the den and whatever room I happened to be in. If I got the desktop first, I would not have a computer when I travel. Obviously, I would not be using both at the same time. After a lot of deliberation, I hit upon an idea: why couldn’t I have both? And so I set about putting together a custom-designed kiosk setup. An old monitor that I bought at a charity auction for $5. Finding a slim LCD monitor at that price point was the icing on the cake. A new USB Keyboard and mouse that I bought from the local electronics store. One of the many ethernet cables from the big box of wires in the attic. Because I plan to leave the netbook plugged in at all times, I did not want the battery to die. To stop that from happening, I removed the battery from the netbook and stored it safely for use when I travel. I then plugged in the power directly to the netbook and attached the USB mouse, USB keyboard, and Ethernet cable (to the router). I finally connected the monitor to the VGA port. Just like that, my kiosk was ready. The netbook is always on and serves as a printing or surfing station at home making it just like a desktop. When I travel, I just unplug all the wires, snap on the battery and take it with me. With a little creative thinking, I finally have one computer that serves two purposes – netbook as well as a desktop. How can RIM survive the mobile market bloodbath? The last few years have been extremely difficult for RIM. The troubled company has been trying to hold on to its success of the past decade. With iOS, Android, and Windows mobile grabbing the market share, RIM is unable to keep the growth steady. In fact, the market share is dwindling and the shareholders are not very happy. What can the troubled BlackBerry phone maker do to survive and succeed? RIM has a few strengths that are unbeatable. The patented keyboard is the biggest one. You can type without looking at the phone! You can type quite fast and so far, no other device has been able to come up with a better keyboard. This keyboard obviously provides better user experience for business users. For example, much as I love the iPad, I can’t ever imagine typing without a keyboard for extended periods of time. Governments, mega-corporations, law enforcement, intelligence agencies, and even individuals have great use for the encryption provided by BlackBerry. Nobody has been able to come up with a better encryption system. There have been instances where even governments have been unable to decrypt the code and they have asked RIM to place a server locally. It’s that secure. RIM must enhance and market the encryption feature on the BlackBerry that no other mobile manufacturer can give us today. If Apple came up with an iPad, RIM did not have to ape Apple. HP actually killed its tablet project. If a mammoth like HP can stop manufacturing the tablet, RIM should have never entered the tablet market in the first place. RIM should just focus on its niche area and strive to succeed. RIM does not have to start competing on every front. Remember what happened when Adolf Hitler attacked Russia during World War II? Germany was fighting on multiple fronts. Similarly, RIM needs to stay focused and not compete on all fronts by aping competitors. There are numerous Android and iOS touch screen devices out there. RIM need not build another one. BlackBerry Storm never did as well as the BlackBerry Curve or the BlackBerry Pearl! Gaming Apps aren’t the only thing in the world! It’s true that apps lead to a lot of revenue. Business users use quite a few apps. Moreover, Business = Revenue; so theoretically, business apps can generate a lot of revenue since a business will see value in spending for it. BlackBerry, being a business phone, needs to focus only on promoting apps for business and maybe social media. Focusing on all types of apps is pointless and even if developers build a wide range of apps (say, for education) it is a bit too late for RIM to enter new app markets. RIM must use its strengths to venture into new markets where nobody can follow. Licensing its encryption to high-security areas like Defense, Financial Telecommunication (like SWIFT), or secure Government communication. Licensing its encryption to enterprises will lead to a lot of revenue. BYOD will work if companies use RIM servers and integrate it with various devices. I am sure companies want secure communication and also allow users to use the iPhone. Licensing its encryption to consumers directly will also lead to a lot of revenue. RIM can come up with an app that allows all iPhone users and Android users use its encryption. RIM can charge for the iPhone/Android app and also a subscription fee to generate revenue. If companies like Surf Easy and Hotspot Shield can make money just by selling encryption, so can RIM. I would surely pay $50 for an app or $10 a month for as service that allows secure communication between my iPhone and the Internet that nobody in the world can hack into. Imagine the revenue RIM could generate from the millions of smartphones out there! RIM can also venture into building new devices for law enforcement. For example, a BlackBerry with a fingerprint recognition device built-in that scans and identifies fingerprints securely from various government databases will generate a lot of revenue. This device will enhance national security and nations will surely spend for it. Apple (iOS) and Google (Android) are the new kids on the block. However, RIM has been here forever (well, almost forever). Only time will tell if RIM will emerge unscathed from this bloodthirsty mobile war, or whether it will fade away into oblivion. Until then, the clickety-clack sounds of BlackBerry will keep ringing in our ears.